Putting a couple of chocolate Santas in a stocking on Christmas eve is apparently no longer enough. 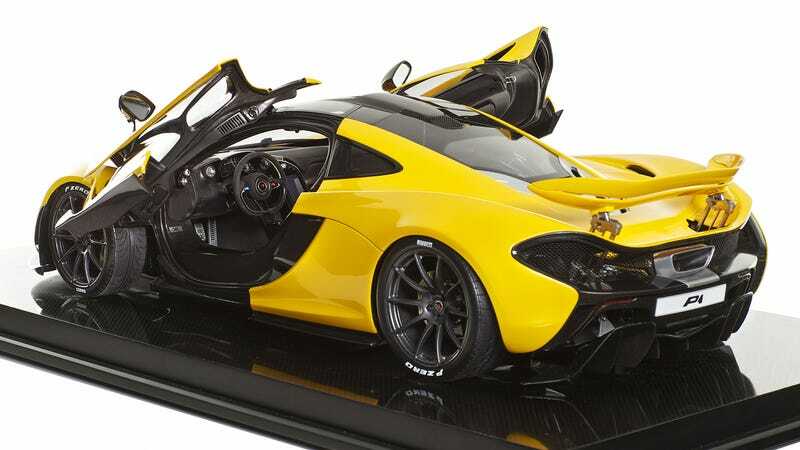 McLaren, makers of some of the most expensive sports cars in the world, suggests slipping a 1:8-scale replica of the company’s P1 in a stocking for a truly memorable Christmas morning. As of last week McLaren officially stopped production of the P1 after building 375 vehicles, which means that from here on out you can only buy one used. Unless you’re happy to settle with this 1:8-scale replica from Amalgam Fine Model Cars that flawlessly reproduces every last detail of the actual car—except for a working motor. Is $12,000 a lot of money to pay for an automotive replica that goes so far as to replicate the same creases in the seats as the real-life P1 has? Of course it is, that’s not even a question you have to ask. $12,000 is a lot of money to pay for a toy car.